If you’ve never gone out of your way to insult the way Chris Brown lives his life, I suggest you keep it that way. I say this not out of support for the song-and-dance man, but because attacking him in any way permanently puts you on the figurative hit list of the living, breathing Mean Girl entity that is #TeamBreezy. For those of us who have taken the plunge, however, we have an unfortunate but important public duty to raise awareness about just how icky he is, whenever the opportunity presents itself. Which is constantly. Today’s incident: Chris Brown got a tattoo. 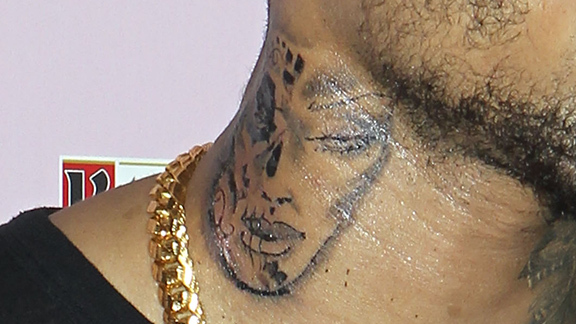 A neck tattoo. And it sure looks like Rihanna. A scarred, bloody, and beaten-up Rihanna. A representative for Brown (whatever that means) said “It’s not Rihanna,” but know that that person is probably lying. But even if it somehow weren’t her, why would a man who infamously battered his famous girlfriend at the time, leaving her face bruised and bloody, then get a tattoo of a woman whose face is bruised and bloody? Even though it’s challenging, because of the striking resemblance (because it’s Rihanna), the identity of the tattoo is besides the point. What’s important is that with every passing year, it becomes increasingly clear the guy hasn’t a single apologetic bone in his body. But know that the tattoo is, in fact, Rihanna. I don’t care if the tattoo artist came out and said, “Chris walked in and all he said was, ‘Give me a tattoo that has nothing to do with Rihanna,'” I would assume that was code for, “Give me a tattoo on my neck that resembles the image of Rihanna after I hospitalized her by beating her with a combination of my fist and my cell phone.” Why? In a sick, twisted way, I’m really happy this tattoo exists. We, as a culture, need him to do things like get tattoos of physically abused ex-girlfriends on his neck so that we never forget who we’re dealing with. For every Benny Benassi–produced club banger or Busta Rhymes–assisted radio mainstay, we need a chair through the window or a disrespectful neck tat. We can’t ever lose sight, not for a second, that Chris Brown is the worst kind of guy. Not for a second.